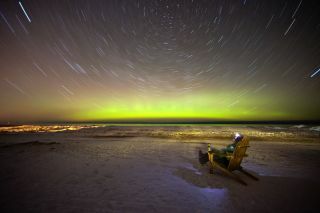 Astrophotographer Shawn Malone of Marquette, Mich., took this shot of an aurora on Feb. 18, 2012. Malone appears in the photo seated in the chair. Scientists may have solved a longstanding mystery about the origin of the energetic particles that cause Earth's dramatic aurora displays. The electrons responsible for the auroras — also known as the northern and southern lights — are likely accelerated to incredible speeds in an active region of Earth's magnetosphere, according to a new study. This region is 1,000 times larger than scientists had thought possible, providing enough volume to generate lots of the fast-moving electrons, the study reports. "People have been thinking this region is tiny," lead author Jan Egedal, of the Massachusetts Institute of Technology, said in a statement. But now, he added, "we’ve shown it can be very large, and can accelerate many electrons." Egedal and his colleagues analyzed data gathered by various spacecraft, including the European Space Agency's four Cluster probes. They also performed simulations using a supercomputer called Kraken at the United States Department of Energy's Oak Ridge National Laboratory in Tennessee. Kraken has 112,000 processors working in parallel. The team used 25,000 of these processors for 11 days, following the motions of 180 billion simulated particles in space to map out how aurora-generating electrons move. The researchers determined that these electrons are likely being rocketed to their tremendous speeds in the magnetotail, a portion of Earth's protective magnetosphere that has been pushed far into space by the solar wind. As the solar wind — the million-mph stream of charged particles coming from the sun — stretches Earth's magnetic-field lines, the field stores energy like a rubber band being stretched, Egedal said. When the normally parallel field lines reconnect, that energy is released like a rubber band being snapped, and electrons are propelled back toward our planet at fantastic speeds. Some physicists had viewed this origin story for the aurora-causing electrons as improbable, because they didn't think the active magnetotail region was big enough to generate the huge numbers of electrons that slam into Earth's atmosphere. Egedal and his team found, however, that the region is likely plenty big — roughly 1,000 times larger, in fact, than theorists had thought possible. "It used to be people said this was a crazy idea," Egedal said. "I don’t get that anymore." In addition to creating a beautiful glow at Earth's higher latitudes, these super-energetic electrons can damage or destroy spacecraft. So a better understanding of their behavior may help operators better protect their satellites, researchers said. The study is detailed in the Feb. 26 edition of the journal Nature Physics.